In 2011, massive protests and gun battles in Tunisia spread to Libya, and by February, the bloodbath in Libya spread from Benghazi and Tobruk in the east to Tripoli in the west. This caused a massive refugee crisis in Libya, with hundreds of thousands of refugees pouring into Egypt and neighboring countries, and across the Mediterranean into Europe. That led the Arab League to demand that the West implement a no-fly zone, and approval by the UN Security Council. The no-fly zone eventually led to the war in Libya, and the death of Muammar Gaddafi. The way it works is that Russia demands that any military action taken by the United States or Nato must be approved by the UN Security Council, giving the Russians an effective veto of the US and Nato foreign policy. On the other hand, Russia can invade Ukraine, invade Crimea, annex Crimea, support war crimes by Syria's Bashar al-Assad, all without getting any UN approval. So Russia has complete military freedom, while the West is constrained by Russia's UNSC veto. It's really a remarkable plan, and it's been incredibly successful, completely crippling the UN, and turning it into a body that provides cover for international criminals, rather than stopping them. China has adopted a variation of the same strategy. China has built artificial islands in the South China Sea, annexing other countries' regions or blocking access by other countries to their centuries-old fishing grounds, and has turned those artificial islands into massive military bases. The United Nations Permanent Court of Arbitration in the Hague eviscerated all of China's claims in the South China Sea, in July, 2013, and ruled that all of China's activities are unambiguously violations of international law. China's reaction is to say that international law doesn't apply to them. China has also been using its military to bully other nations into supporting them. It's as if the KKK lynched 10 black men and then bullied cops and judges into supporting them. So Russia and China have made it clear that international law doesn't apply to them, and they can do anything they want, and they'll kill anyone who tries to stop them. Two recent international events, both major and remarkable, have made it clear that this strategy is no longer working. The first is the North Korea situation, where the Donald Trump administration had made military threats that are actually credible. A lot of people have said publicly that they think that Trump is crazy, but that's a negotiating strategy that's worked to his advantage, since both China and North Korea think he's crazy enough to carry through with his threat. And it's clear that any military action taken by the Trump administration will not be subject to a Russian or Chinese veto in the UN Security Council. The second remarkable international event is the Western reaction to the March 4 poisoning of former Russian double agent Sergei Skripal and his daughter Yulia, using a Russia-developed nerve agent Novichok. At this writing, both of the poison victims are in hospital, and are not expected to survive. From the beginning, there was little doubt that Russia was responsible, and that they were sure they would get away with it, because of Russia's veto power in the UN Security Council. 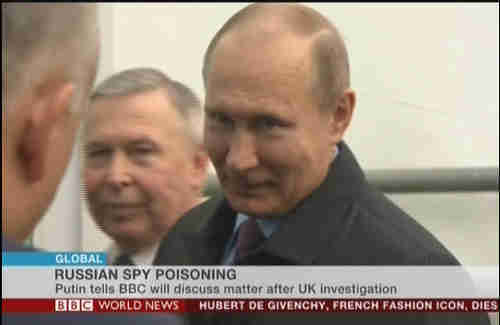 As I reported in my article, Russia's president Vladimir Putin smirked and gave a sarcastic answer when a BBC reporter asked about it. This was followed by a massive disinformation campaign by Russia by Russian trolls, calling the accusations a "circus show," a "fairy tale," and a "plot to victimize Russia." On the BBC a couple of days ago, I heard a Russian official claim that this was the latest in 200 years of Western attacks on Russia. "There is something in the kind of smug, sarcastic response that we�ve heard that indicates their fundamental guilt. They want to simultaneously deny it, yet at the same time to glory in it. There is very little doubt in people�s minds that this is a signature act by the Russia state � deliberately using novichok, a nerve agent developed by Russia to punish a Russian defector as they would see it, and in the run up to Vladimir Putin�s election. This was a former Russian agent living in this country who had been singled out already by the Russian state as an object for revenge and retaliation, and Vladimir Putin has been on the TV only recently saying that such people deserve to be poisoned, to choke on their own 30 pieces of silver. This is a way of showing look at what happens to people who stand up to our regime." An investigation of the evidence by scientists from Britain and several other European countries led to the conclusion that Russia, and probably Putin himself, were responsible for the poisoning. That much isn't remarkable at all. Putin has had other former agents poisoned in the past, and has violated international law many times, and there were the same kinds of investigations, and the same kinds of disinformation campaigns by Russian trolls. And there was always the same smirk, because Putin knew that he would get away with it. What is remarkable this time is that Western nations were united in backing Britain's prime minister Theresa May in taking action against Russia. Over 20 countries, including the US, Canada, and several European Union countries, have expelled Russian diplomats. "The fact that major Western powers can gang up and "sentence" a foreign country without following the same procedures other countries abide by and according to the basic tenets of international law is chilling. During the Cold War, not one Western nation would have dared to make such a provocation and yet today it is carried out with unrestrained ease. Such actions are nothing more than a form of Western bullying that threatens global peace and justice." It's laughable to read about the Chinese appealing to international law. Keep in mind that what the Chinese are whining about is expelling some diplomats. Contrast that to China's actions in the South China Sea, which are violations of international law thousands of times more serious than just expelling diplomats. However, the article is right to say, "During the Cold War, not one Western nation would have dared to make such a provocation and yet today it is carried out with unrestrained ease." That was during a generational Unraveling era, when everybody's behavior is far more compromising. Today, the world is deep into a generational Crisis era, and as I've written many dozens of times in recent years, populations are becoming increasingly nationalistic, belligerent and xenophobic. "Over the past few years the international standard has been falsified and manipulated in ways never seen before. The fundamental reason behind reducing global standards is rooted in post-Cold War power disparities. The US, along with their allies, jammed their ambitions into the international standards so their actions, which were supposed to follow a set of standardized procedures and protocol, were really nothing more than profit-seizing opportunities designed only for themselves. These same Western nations activated in full-force public opinion-shaping platforms and media agencies to defend and justify such privileges." This is a typical Chinese anti-American rant. I don't know what "full-force public opinion-shaping platforms and media agencies" this is referring to, but in the West we have news sources expressing all points of view, while in China if you express a view not approved by the Chinese Communist Party, then you can get yourself abducted, thrown into a pit, tortured and killed. "As of late, more foreign countries have been victimized by Western rhetoric and nonsensical diplomatic measures. In the end, the leaders of these nations are forced to wear a hat featuring slogans and words that read "oppressing their own people," "authoritarian," or "ethnic cleansing," regardless of their innocence." Who are these Chinese talking about? Maybe they're talking about the officials in Myanmar (Burma) who are performing genocide and ethnic cleansing on the Rohingyas. "It is beyond outrageous how the US and Europe have treated Russia. Their actions represent a frivolity and recklessness that has grown to characterize Western hegemony that only knows how to contaminate international relations. Right now is the perfect time for non-Western nations to strengthen unity and collaborative efforts among one another. These nations need to establish a level of independence outside the reach of Western influence while breaking the chains of monopolization declarations, predetermined adjudications, and come to value their own judgement abilities. It's already understood that to achieve such international collective efforts is easier said than done as they require foundational support before anything can happen. Until a new line of allies emerges, multi-national associations like BRICS, or even the Shanghai Cooperation Organization, need to provide value to those non-Western nations and actively create alliances with them. What Russia is experiencing right could serve as a reflection of how other non-Western nations can expect to be treated in the not-to-distant future. Expelling Russian diplomats simultaneously is hardly enough to deter Russia. Overall, it's an intimidation tactic that has become emblematic of Western nations, and furthermore, such measures are not supported by international law and therefore unjustified. More importantly, the international community should have the tools and means to counterbalance such actions." This gets to the heart of the matter. The Chinese are proposing to create another international organization, perhaps a competitor to the United Nations, where they would be in control. This idea is completely delusional, since even if such an organization existed, it would run into the same kinds of conflicts that occur in the UN Security Council. Russia and China in particular were almost in full-scale war with each other in the 1960s. Today they have a marriage of convenience because they're both annexing other countries' regions, doing what Hitler did prior to WW II, and using each other to justify their actions. Russia and China are basically two criminal countries, applying the rule of "honor among thieves." But the real message here is that China and Russia wish to formalize their rejection of international law, which has formed the basis of peace since the end of World War II. China has begun conducting massive maritime combat drills, including dozens of vessels mobilized in the South China Sea as part of what the military said would be bigger, more frequent exercises in the tense region. It appears increasingly that China is preparing its population for war. This is an essential first step before actually launching a war.